Who does not love to set a song on iPhone as a ringtone? But, many fear the process and compromise with the available ringtones in iPhone. Yes, doing so with iTunes takes time, and hence you must know the quick and easy method now. Nothing can become an impossible task with advancement in technology. Then you must know how to set a song as a ringtone on iPhone without iTunes. That’s the reason behind drafting this post. Above all, Apple has removed the manage apps and ringtone functionality from the recently newly released iTunes 12.7. You will find a display as “iTunes has obtained an update and will focus on audiobooks, podcasts, TV Shows, movies, and music.” You will not find the apps and the Tones tabs anymore in iTunes. This is a shock for ringtones fans, which generates much inconvenience. Mostly apple users frustrate with iTunes. You, being an iPhone user, won’t deny this fact for the very reason that iTunes complicate things. Therefore, an alternate approach has always stood on top of people mind. Whether you want to set a song as ringtone iPhone or transfer media has now become possible without iTunes. Yes, the finest iPhone file manager namely iMyFone TunesMate has got pride in helping iPhone users with its best features. You can now not wonder how to set a song as a ringtone on iPhone without iTunes as you’re getting close to an easy way to fix any song as your custom ringtone without syncing with iPhone. Make/Transfer/Share Ringtones? TunesMate Has You Covered! Make personalized ringtones either with the already stored music on your iPhone or from the computer. Customize ringtones from purchased or non-purchased song. Simply decide one particular section anywhere from the song and use it to be your tone. Save the custom ringtone directly to your iPhone without going through iTunes. Transfer ringtones as you like, freely between iPhone and computer. Trust you feel great about these features, and yes it is. Lots of media websites speak volume for TunesMate, including getintopc.com, tricksworldzz.com, crunchytricks.com, etc. Step 1: Connect the iPhone to the computer with the USB cable. Ensure iMyFone TunesMate is installed on the computer. Step 2: Go to the display top and select the “Music” tab. Go to “Ringtones > Ringtone Maker”. Step 3: Use “Local Music” or “Device Music” to select a song from computer or your iPhone. 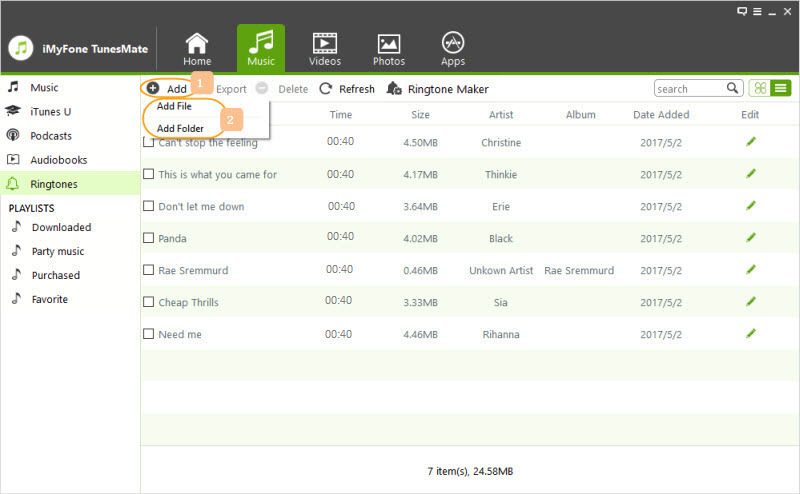 Step 4: Now the song will get played, and listen to it to decide on extracting the favorite lines. Start and stop on those lines. Now, you can go to “Settings > Sounds” and set the ringtones under “SOUNDS AND VIBRATION PATTERNS”. Step 1: When TunesMate detects your iPhone, Go to “Music > Ringtones”. 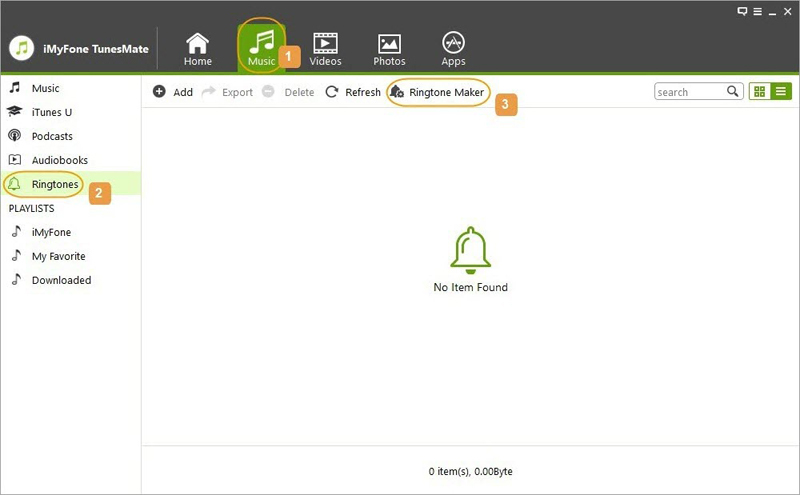 Step 2: Click “Add > Add File” and browse the ringtones on your computer. Select and click “Open” to let it transfer. When it’s done, you can set it as your tones on your iPhone. Why Choose TunesMate Instead of iTunes? 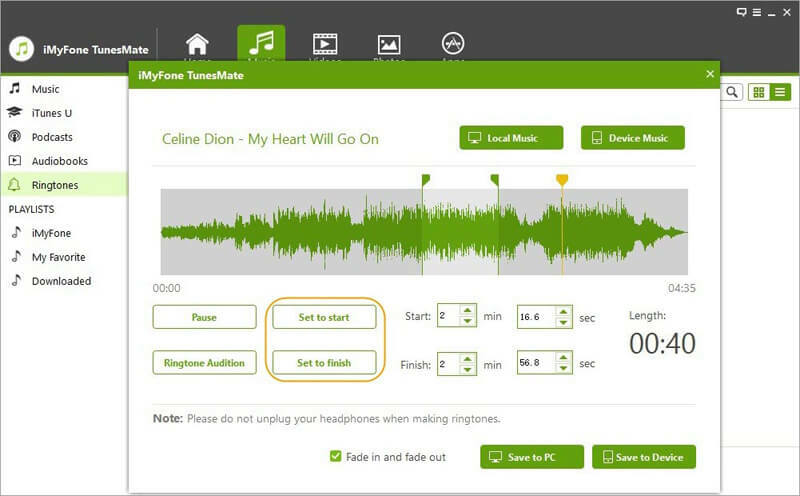 Life has become simple and easy with iMyFone TunesMate. Don’t need to wait behind iTunes and the cumbersome process anymore. Get going with your preferred song as a ringtone on your iPhone.